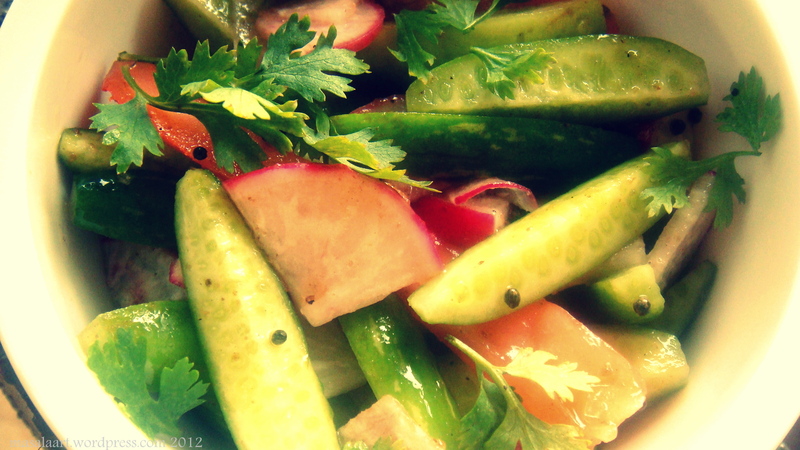 Tendli Or Ivy Gourd Salad. Clearly October Is A Problem Month For Me. Wow. A whole month, with 31 days, holidays like Dusshera and Eid and Halloween and campaigns for Breast Cancer Awareness and so much scope to create so many wonderful things in the kitchen, and I come up with a grand total of 3 posts, out of which only one is a recipe post. I think October just slows me down in some strange way because my birthday comes in this month and I am too caught up in reflecting on what I have done in the past year and how quickly time has gone by etc etc etc. Something happens and I slow down; or I get busier on the work front; or I just lose the tempo. I think it’s a combination of all three, with some lethargy thrown in, which is actually just a cop-out for being lazy and not looking for inspiration. Anyway, in a previous post, I waxed eloquent about how great ivy gourd (tendli or kovakkai) is for you, and here I produce the recipe that didn’t follow that post. I chanced upon some lovely baby red turnips, so I added them in there for the colour and the sharpness. Heat the oil in a tempering dish, add the mustard seeds and allow them to pop. Pour the tempering over the salad, mix well and serve. Well, here’s to the month gone by. And here’s to snapping out of blogging limbo in November! Yummy…… I love tendlis and we get a regular supply from our veggie garden……. so always looking for new ways to cook them……….. only problem can’t get red turnips in Cochin…………will substitute strips of crunchy red pepper………..